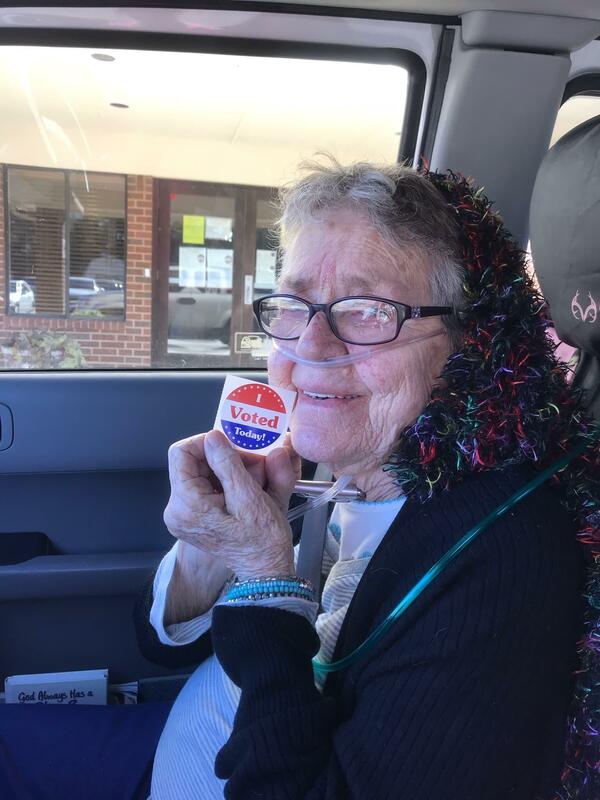 An 82-year-old great-grandmother from Texas voted for the first time ever during this year's midterm elections. Gracie Phillips was battling pneumonia and in hospice care when she voted early Thursday. Sadly, just four days after casting her midterm ballot, Phillips died — but not before she had her voice heard and her opinion counted, her granddaughters told CBS News. Phillips registered to vote in Grand Prairie, Texas, last month, just before she was admitted to the hospital. "With such a large family started at such a young age, priorities in 1951 weren't the same out here in the country," her granddaughter, Michelle Phillips, told CBS News. "Women were allowed to vote, but she was raising seven children and trying to work... [voting] kept getting pushed aside and she decided this year, 'I'm registering.'" Phillips had seven children, 20 grandchildren, 33 great-grandchildren and one great-great-grandchild, her granddaughter, Leslie Moore, told CBS News. She experienced a lot in her life but determined she should finally experience voting, too. "It became so important to her and it was something she talked about," Michelle Phillips said. "I think it really helped for her to have that goal, hoping she could get better so we could get her home from the ICU [before Election Day]." The great-grandmother was still in the hospital when early voting started, and her daughter struggled to decide if she should take her out to the polls. "She finally decided it's so important to granny, so they took her last Thursday," Phillips said. The poll workers were extremely kind to Phillips, her granddaughters said. She had a portable oxygen tank with her, so they brought the ballot to the parking lot so she wouldn't have to leave her car. Poll workers even blocked the windshield so no one could see who she was voting for as she filled out the ballot in the car. Phillips felt accomplished after casting her ballot. "It was something that was always weighing on her and something that she always wanted to do," her granddaughter said. "She was very proud, and she kept saying, 'I voted. Did you vote? Who did you vote for?'" Moore said. Phillips encouraged her whole family to go out and vote. The granddaughters described Gracie Phillips as "always happy" and an avid sports fan. She loved the Rangers and Cowboys and "her day would be affected when Romo couldn't throw a pass." She will be missed by her family and friends very much, Moore and Phillips said. "For her, it didn't matter what political affiliation that you held, as long as you voiced your opinion and were heard. And her opinion is now on the record forever," Phillips said. "I think it's important that everybody in this political climate, that we learn to listen, because she always did." "And respect opinions and don't judge others," Moore chimed in. "Because nothing's going to change unless we start communicating and actually listen to each other," Phillips said.